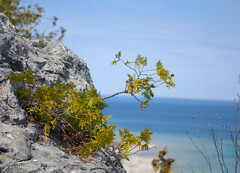 While on Mackinac Island we stopped by to do the Arch Rock Earthcache. We ended up spending some time here acting more like tourists than Geocachers. Drie really loves these trees that grow out of the rocks, so I did my best to get a good shot of this one.